Pupils at the academy show off their LiFi-XC Stations that plug into their laptops. 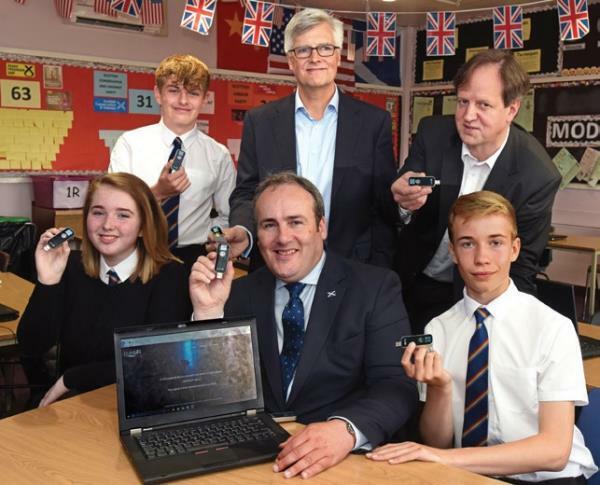 Also pictured: pureLiFi CEO Alistair Banham (standing centre); Professor Harald Haas (standing right); and Scottish MSP Paul Wheelhouse (seated middle). A Scottish secondary school is claiming a world first with the deployment of a pilot wireless network that uses LiFi technology. Pupils at the Kyle Academy in Ayr are using a high-speed wireless internet connection that uses light, rather than radio waves used in Wi-Fi, to transmit data. By using light waves, LiFi is said to offer “unprecedented” bandwidth. At Kyle Academy, it is expected to significantly enhance the connectivity of the classroom and enhance the learning environment for pupils. According to researchers, light spectrum is 10,000 times wider than RF spectrum. Li-Fi operates in visible light frequencies between 400THz and 800THz. As this is at the higher range of the electromagnetic spectrum, the technology is able to deliver higher capacity throughput of up to 1Gbps. The idea of using off-the-shelf light bulbs for super high-speed transmission initially came from research carried out by Harald Haas, professor of mobile communications at Edinburgh University’s School of Engineering/Institute of Digital Communications, in 2011. The following year, Haas went on to co-found pureLiFi in order to commercialise the technology. The installation at Kyle Academy includes pureLiFi’s LiFi-XC system. This comprises eight LiFi-enabled LED bulbs in the ceiling, and students have been given access to LiFi-XC Stations that plug into their laptops enabling high-speed connectivity through the lights. The Kyle Academy project is being conducted in conjunction with the University of Edinburgh and is being overseen by Scottish Futures Trust, which supports the Scottish Government’s Digital Strategy. The Scottish Government also supported the pilot with a £16,000 grant through its Digital Schools initiative for equipment and installation. pureLiFi and the LiFi Research and Development Centre at the University of Edinburgh provided resources for the execution of the pilot with hands-on support and subsequent testing.